A man is doomed to live and relieve a single day in his life until he solves the problem(s) the day presents. Sounds like a great idea for a movie, eh? And why not? You enjoyed it when they called it Groundhog Day (1993). You may even have found it exciting and intriguing in Source Code (2011). So why not take the same premise and do it again? This time around our protagonist is Major William Cage (Tom Cruise), who had to make a choice how he would fight back after a deadly alien attack has taken over continental Europe. The aliens, known as mimics for no discernible reason, have been unstoppable until their defeat at the Battle of Verdun, where Sgt. Rita Vrataski (Emily Blunt) was the hero of the day. Now commanding General Brigham (Brendan Gleeson) sees the tide turning and he has a new role for Cage who has essentially been doing PR for the war effort. He’s going to be with the troops when they invade and provide morale boosting reports. Cage, somewhat of a chickenhawk – always ready to rally the troops as long as his own neck isn’t on the line – refuses, not quite understanding the chain of command. He wakes up busted to private and thrown into a platoon led by Master Sergeant Farrell (Bill Paxton). He is sent into combat barely trained and, of course, dies. However, something has happened to him during an encounter with one of the aliens that causes him to go back to the moment when he becomes a private. This happens again and again, ending each time with his death and a reboot. From here on out you know where the story is going: Cage and his eventual ally Vrataski will keep trying and failing but learning something more that they can use on their next go round. "For summer entertainment, it will more than do." It’s an exciting and entertaining movie because we get caught up with the problem solving, and because Cruise plays against his usual action hero persona. In a sense, the story is about Cage slowly learning that if they are going to defeat the aliens, his role is crucial and he can’t opt out. There’s also some leavening humor, particularly from Paxton as the sarcastic sergeant. When Cruise returns and starts anticipating what he will do and say, the scenes work because of Paxton’s reactions. As for the war itself, the aliens are a neat special effect but we learn nothing about them or their motives. They may as well be an unending stream of enemies generated in a video game. 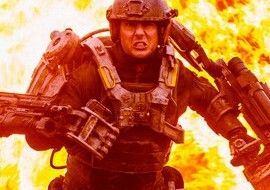 There’s plenty of action, even if the payoff seems akin to the one in Cruise’s last SF film, last summer’s Oblivion. Fair to say, this is the much better film. If there’s a tinge of regret it’s that none of these films take the concept of a time loop very far. The late Ken Grimwood’s World Fantasy Award winning novel, Replay, is about a man who dies in his forties and then wakes up in his college dorm room in his twenties with his memories intact. Having an opportunity to relive a life – or completely change it – proves to be both more ambitious and more poignant. It’s not merely the one day do-over that the characters in Edge of Tomorrow and the earlier films get. That said, Edge of Tomorrow is a thoughtful, action-packed, and occasionally amusing take on the premise melded into the alien invasion story. For summer entertainment, it will more than do.